A quick peek at some food photography I did recently. It's always challenging to photograph raw fish so I'm quite happy with these two shots. The logo for TfL's Night Tube Service has two gorgeous little details. The eyes and the beak of the owl are glyphs (o's and dot of the i, respectively) that are pulled directly from their official typeface, Johnston Underground. It's not just a clever touch though – details like this help make the logo feel instantly familiar and unify it with the rest of TfL's visual language. 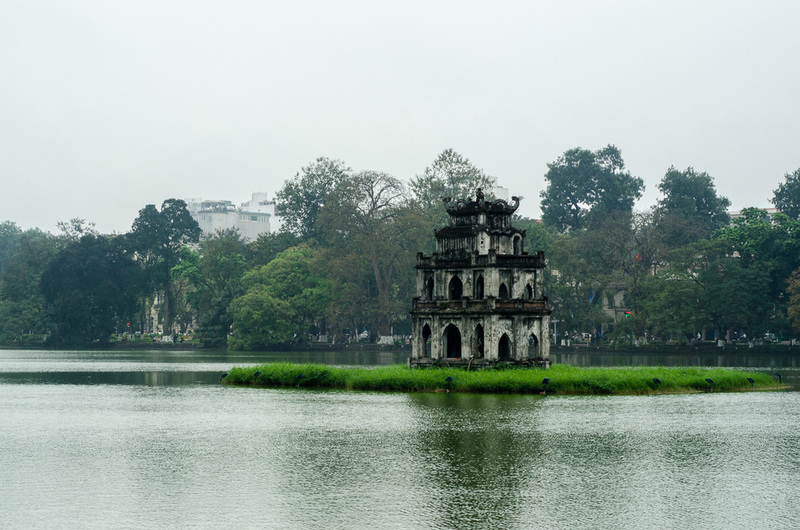 More photos from our brief stay in Hanoi. Some select shots from the streets of Hanoi, Vietnam. The interiors are all from the Temple of Literature. I'm tempted to say, right off the bat, that these are the best mince pies in London. If they're not, they're certainly a contender for that title, something I feel somewhat qualified to judge*. Yeast Bakery's mince pies are beautiful. Every single part of them feels as though it was created with love, care and attention. The details are beautiful and carefully considered as well. When I picked up the box, I was immediately drawn to the paper tags, a lovely, off-white, natural paper with a lovely toot. When I complimented Angela (one of the owners) on the tags, she laughed and told me that she'd made the paper herself. Astonishing. They're beautifully constructed and perfectly baked. The short crust pastry is surprisingly substantial and gives these pies a wonderful weight – they don't fall apart in your hand like the Duchy Originals. That weight only enhances the experience in that each pie feels more solid and more real than say, the thin crust mince pies from Konditor and Cook. As you'll see below, the pastry maintains its shape and rise even as it's being eaten. Form aside, they're delicious. The mince filling is rich, moist and perfect. It's a classic mixture of fruit and feels instantly familiar without being tired. It's a perfect example of how if something isn't broken, it shouldn't be fixed (Heston Blumenthal should take note). Frankly, I can't wait to go back this Saturday for more. * When I worked at Reevoo, a colleague brought in every single brand of mince pie available and we spent a morning tasting and reviewing them. He and I also once tracked the number of mince pies that we consumed in the month of December. It was well over 30 pies each when we called off the tally. A smattering of shots from the new Dishoom in Kings Cross. I'm a big fan of the current series of Marvel Studios* films. Marvel has brought titles and characters like Thor, Iron Man, Captain America and the Avengers to the big screen with skill and passion, all while respecting the source material. One of the things I enjoy almost more than the films themselves is the Marvel One-Shots – shorts that take place in the same universe and often deal with the minor or supporting characters. The latest of these One-Shots is"All Hail the King", which deals with events from Iron Man 3. While the short is funny and very well executed, the best parts for me was the title treatment and the end credits. With visuals that would feel right at home in a late-70s exploitation or spy film, the titles are awash in colour, geometry and motion. They're a treat to behold, right down to the slightly fuzzy, indistinct letters. The designers of the titles, Perception, wrote up their process for their website. It's a fantastic read and a great insight into their process and execution. * As opposed to the Marvel properties currently being developed by other studios such as Sony's Amazing Spider-Man and Fox's X-Men. Something I'm tinkering with – the proof-reader's marks aren't quite right yet and the positioning of "less" isn't quite working but the sentiment is spot on. My previous blog (more like an online sketchbook, really) can still be found at designmonkey.blogspot.com, but I'll be writing here from now on.